This pear butter is silky smooth and requires very little active time in the kitchen thanks to the help it takes from your slow cooker. Spread it on toast, swirl it into oatmeal, or just eat it out of the jar with a spoon! Peel and core the pears. It is important to peel them because just under pear peels there are specialized cells called scleroids that can have a gritty texture. Peeling the pears will give your finished pear butter a silkier texture. Cut the peeled, cored pears into no larger than 1-inch chunks. 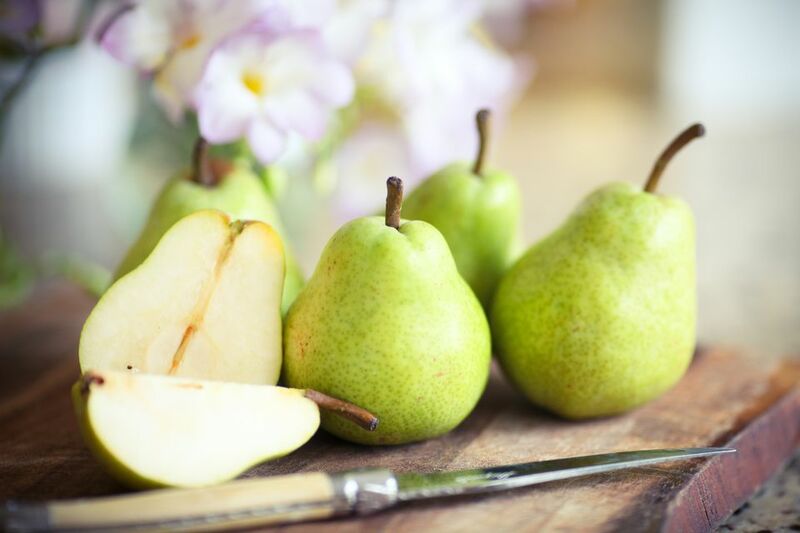 Combine the chopped pears together with the water or juice, honey or sugar (if using), lemon juice and zest in a slow cooker. Cover and cook on the high setting for 4-5 hours, until pears are soft. Use a slotted spoon to transfer the pears to a blender. Reserve any cooking liquid left behind in the slow cooker. Puree the pears, adding just enough of the cooking liquid to get a thick, spreadable consistency. Transfer the pear butter to clean half or quarter pint canning jars, using a butter knife, spoon, or your scrupulously clean fingers to press out any air bubbles. Leave 1/2-inch headspace between the top of the food and the rim of each jar. It is not necessary to sterilize the jars for this recipe. Screw on 2-piece canning lids. Process in a boiling water bath for 20 minutes. Spiced Pear Butter: A touch of cinnamon, spicebush, ginger, allspice, or cloves can go nicely with pear butter. But ground spices can turn bitter during the long cooking time in the slow cooker. Instead, wrap whole spices into a small cheesecloth bundle and add it to the pears and other ingredients. Remove the bundle and discard it before pureeing the pear butter. If using ginger, a 1 to 2-inch chunk of the fresh root is plenty. If using whole cloves, do not use more than 2 or three of them or they can overpower the more subtle flavor of the pears. Spiked Pear Butter: Instead of water or pear juice, use an alcoholic liqueur. Williams Pear Liqueur is an obvious and delicious choice, but cognac and other brandies are good with pears as well. A great option is Tawny Port and Pear Butter. How Do You Make Homemade Maraschino Cherries?